Mama Mo Stamps: Tart & Tangy Thanks! Hello! 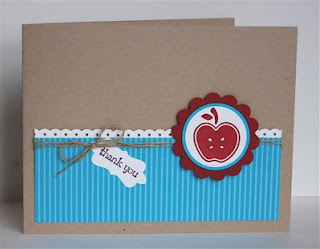 Here's a cute little card, perfect for teacher's appreciation or end of the year gifts. I made this using The Outlawz CAS Challenge: A recipe- At least 2 punches (I used quite a few more :), the color blue & 1 plain sheet of cardstock. I'd love it if you joined us!! To purchase these or other SU! Supplies, visit my online store 24/7! So adorable Mo!! Love it!! Thank you for sharing your card.. I just love it. Please come and visit my blog: http://jessicalynnoriginal.blogspot.com/ I have a free digital stamp there & contest.